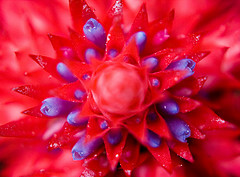 Bromeliad is the name for a family of plants that is incredibly diverse. There are 2,877 different species of bromeliads. And just about as many ways to care for them as there are different varieties. That being said there are a few things that will remain true for the majority of bromeliads and general principles of bromeliad care that will remain consistent. The following are tips for both indoor and outdoor bromeliad care and maintenance. 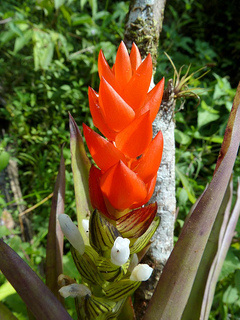 Almost all bromeliads are native to tropical climates. Their original habitat is humid and they grow on shady forest floors or attached to trees. This means bromeliads are adapted for warm, wet, shady climates. If you live in an area that will not freeze, you can safely plant your bromeliad outside. However, make sure you have a space that will not expose your bromeliad to large amounts of direct sunlight. A bromeliad can experience leaf burn if exposed to too much direct light. Different varieties have different tolerances for exposure to sun. Monitor your site to determine how much direct sun it receives and at what time of day and then purchase a bromeliad whose needs align with your site specifications. It is also important that your bromeliad remains moist. If you live in an arid climate there are some bromeliads that are better suited to handle dry air. You may need to mist a bromeliad regularly if the humidity is less than ideal (60%). Be sure to mist when your plant’s leaves are dry, but before they are exposed to any direct sun. For those living in climates with a colder season, you will want to consider planting your bromeliads in containers. If you want the bromeliads to appear as part of your landscaping, dig a hole and bury the container. Be sure that your container has adequate drainage so the rainwater is not trapped within. This is a clever way to make the bromeliad appear as if it is growing from the ground, but allows for it to be easily transported inside before any damaging frost sets in. Bromeliads also make great indoor plants. They have few needs and very few problem pests. With the right care, you can enjoy bromeliads in your home or office year round. 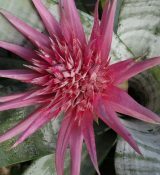 Bromeliads are adapted to withstand drought, but are much less tolerant of being over-watered which can cause root rot. It is important that your bromeliad is planted in a medium that allows for fast drainage. Each time you water the potting medium, thoroughly soak it so that the water runs from the drainage holes. This will remove any salt build up in the potting media. Don’t water the bromeliad again until at least the top two inches of potting media are dry. Any more often than this and the plant will be sitting in too much water and could succumb to root rot. Many bromeliads also have a tank. This is the part of the plant where the leaves meet together and form what looks like a cup. Bromeliads also take in water through their central tank. Fill the tank with water, preferably rainwater, and be sure to flush it regularly to prevent water stagnation. If you have an epiphytic bromeliad, meaning your plant is growing on a rock, tree bark, or somehow mounted instead of potted in medium, watering is a bit different. You can simply keep the plant moist by misting it regularly. Just like bromeliads that are grown outdoors, indoor bromeliads also prefer 60% humidity. This level of humidity can be very difficult to maintain especially in a home that is being heated by a furnace in the winter season. There are several options for increasing humidity levels. Create a humidity tray. Simply take a shallow plant saucer, or tray, and fill it with small pebbles or decorative stones. Fill the tray with water to just below the stones’ surface. Then set your potted bromeliads on or near the tray. The water will add moisture to the air and increase humidity in that area. If you set the container on top to the tray, it is important to make sure it is not setting in the water. This will keep the bromeliad’s roots too wet and can result in root rot. Pots and potting media can directly affect the moisture levels in the bromeliad. Plastic pots tend to hold moisture for a longer period of time. If you are in an arid region or raising you bromeliad in a heated home, you may want to consider a plastic container to house your plant in. Unglazed clay pots are porous and allow water to seep out. If you are living in a very humid area, you may want to consider this type of container so your plant doesn’t stay overly wet. You will want to make sure that there is some sort of saucer or pad underneath to catch the seeping water otherwise you could end up damaging the the floor or furniture the pot sits on. Regardless the type of container, never use soil when potting your bromeliad. It is too dense and will not allow for the quick drainage that bromeliads require. Instead, use potting mixes specially formulated for bromeliads or mix your own using porous materials. Bromeliads have a wide range of light tolerances. Some varieties prefer bright, indirect light while other thrive in almost constant shade. For the most part, bromeliads thrive in bright, sunny spaces. However, exposure to direct sunlight for an extended period of time can cause damage to the leaves. In the winter, a south facing window is ideal. Bromeliads require little fertiliziing. Occasionally you will want to use a water soluble fertilizer. Never place fertilizer in a bromeliads central tank. Instead, fertilize around the bromeliad’s base. Air plants can benefit from a liquid fertilizer dilluted to 1/2 to 1/4 strength. Simply spray the mixture over your air plant. Many people try to encourage faster growth with the use of fertilizer. But because bromeliads are slow growing plants, too much fertilizer can cause the leaves to become leggy and vibrant colors to diminish. Most bromeliads flower only once in their lifetime. The brightly colored leaves that are often mistaken for flowers are actually called bracts, a leaf-like structure from which an inflorescence may grow. 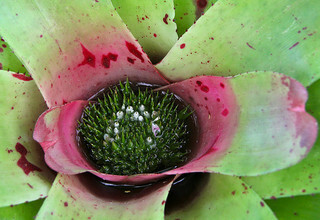 A bromeliad grows by added new leaves to the center of the plant. At some point, the center will become crowded and new leaves will no longer have room to form. At this point, the bromeliad will focus its energy on producing pups, also known as offsets. The bloom on a bromeliad can last several months and the colorful bracts even longer.You can cut back the flower once it becomes unsightly. Use a sharp, sterilized instrument and cut the spike back as far as possible without injuring the remaining portion of the plant. Sadly, the mother plant will eventually die. But hopefully not before producing offspring to continue its legacy. To learn more about pups, check out our free Beginner’s Guide to Bromeliad Pups. Following a few simple steps can keep you enjoying bromeliads, both indoors and out, for several seasons. It is always important to read the specifications for your particular type of bromeliad. Bromeliad care requirements can vary and you may find that you will need to tweak a few things such as light exposure or watering techniques for optimal growth. Do you have any advice for bromeliad plant care indoors in the winter? I live in Nebraska and don’t have a lot of light. So my boyfriend bought me a bromliad while he visiting over my winter break. It’s been holding up rather well even when I had it at home and it was getting too much light. Lately, the blooming part of the plant has started to turn brown on both the bigger and the smaller plant. Neither have started to bloom, like they still look the same as when he had bought them, expect there’s more leaves growing. I got home from work today and saw that my roommate had somehow bent the oval shape part on the bigger one. You have any tips to straighten it back out and to possibly bring color back to the plant? He bought it from Lowe’s ( http://www.lowes.com/pd_34844-28120-LO6B_0__?productId=3356152&Ntt=bromliad&pl=1&currentURL=%2Fpl__0__s%3FNtt%3Dbromliad&facetInfo= ) but unlike the one in the picture, it hadn’t started to bloom yet. Emily, my understanding is that unfortunately these plants only flower once. When the bloom starts to turn brown it is the end for that and it will not return. However, little shoots off to the side of the main plant may have formed. You can keep the whole plant going and these will eventually flower also. Can grow them for awhile still attached to the main plant and eventually repot them as their own main plant. May take a fairly long time to flower, but they are so beautiful that it is worth the wait. I am working on some side shoots now. Great…. Thanks for the information. My main plant is full of shoots now. I didnt know if i had to cut it off from the main source, or wait . Do they like large pots or small pots? depends on what type of bromeliad you have. Check with your local nursery. They do very well in pots, indoors and out. are turning a rusty yellow. the plant receives indirect sunlight and I just started misting the plant. What can I do to keep the plant healthy and presumeably looking better. Thank you! When is a good time to remove the pups? When is a good time to remove the pups and transplant them? once they are about a 1/3 the size of the mother plant. leaves and flower are startinng to get brown tips. How do I correct this. How far apart should they be planted outside? How many times a week and how much water do i give it? Water once a week, or as needed so that the soil dries up a bit between waterings. Keep central cup filled with water, changing the water every few weeks to avoid rot. Thanks for the heads up! We are working to solve these issues. I have a Bromeliad plant i recieve but not sure of care at time til now….however my plant appearently is dried at very top completely but still green on bottem with leaf. My question is can it survive still? And if so how.? is it ok to have an orchid with a bromeliad? That”s the way my gift came. Yes this should be fine. Since they came together, someone most likely put thought into what variety of each plant would grow well together (similar watering, light, etc. needs). However, if a problem ever occurs feel free to write us back. I brought a bromeliad for our two daugthers room, they saw it and love it. My question they are two and four, my hisband and I will be the one to take care of it. Is it a nice plant to have in there room. We live in the SUBURBAN of phildelphia. We love plants i n the house and me and my husband have some just about all the room,s,and was looking for one to put in our daughters’ room.. So did we make a good choice? Should i cut off the brown part of the leaves on my bromelaiD plant? Browning on the tips of the leaves is an indicator that your bromeliad may not be receiving the proper amount of water. First, you will want to re-evaluate your watering schedule. Second, cutting the brown parts of the leaves away is for cosmetic purposes only. If you choose to do this, use a sharp, sterilized blade and only cut what is necessary. (It is easy to go a little overboard). The color will not come back. Once the bromeliad has finished blooming, it will begin to die. But keep a lookout for offshoots called pups. These will be new plants that will replace the dying mother plant and can be removed and re-potted once they are about 1/3 the size of the mother plant. I see you can but DO you absolutely have to remove the pups from the mother plant? Or can you leave them there And they will continue to grow and eventually bloom? Can I plant a mint together with my bromeliad in the same pot? I just purchase a Bromelaids plant , your site is great btw. Thank you. Congratulations on the new plant! WE have had lots of rains in my area for 4 to 5 days..and my bromelias are still outside outside …am i late to move them to a place where they wont get contact with rain water?…..i am afraid the roots will Rot….though the pots have good drainage….or is it ok i leave them where they are? Only bloom once so I was thrilled when it sent up this red shoot. I wish I could send you a picture as I have never seen anything quite Luke it. Please tell me what it IS and I should cut it back and repot to see if it has pups? Thank you. I recently purcHaSed a bromilead with pink brachts, purple infloresence, and dark green leaves with white horizontal frosted stripes. I plan oN keeping it indoors. I’m a bit confused on whether i should keep water in the center cup, in addition to daily misTing, and occasional watering of the soil. It’s a beautiful and unique plant. I would love to enjoy it for many years. I also noticed a small pup forming at the base. Please help! Are these bromeliad type plants poison to cats or dogs? Bromeliads are non-toxic to cats and dogs. no contengan pesticidas, químicos ni demás. My bromeliad hAS SOME WHITE SPOTS ON IT . WHAT SHOULD i DO? a month ago we received a bromeliad for a housewarming gift. What was once bright read leaves are now dried up and brown. I think I overwatered it at first, as some water was sitting at the bottom when I lifted the plant out of the additional pot. Is this what caused the red to dry up and turn brown? How do I go about fixing it? Thank you. If it’s been sitting in water, your bromeliad may have developed root rot. This is often times fatal, but you can try to rescue the plant by removing it from the substrate. Dip it in a fungicide or a root hormone that also contains fungicide. Then, stake it up in a well draining potting medium or next to a healthy bromeliad. The bromeliad should hopefully recover and develop roots. My PLANTS SEEM to be doing WELL IN THE bathroom. IS there ANYTHING I should be doing FOR THEM? you mention that bromeliads are sensitive to metal. I have an indoor metal planter. could I plant them in this without harming them? how well do bromeliads do in shade planted under a structure, such that they will not receive direct rain,but will be hand watered? Can you please tell me the name of the specific soil I need to repot my bromeliad and its pup. No o e in my town seems to know and its my first bromiliad. Thank you!! Is it possible for mosquitoes to breed in bromeliads that store water. I have a bromlelaid but unfortunately the central stem and the flower has died and also its got some blooms what should i do with the dried bit? Shohld i cut it? Would it grow flower again? My brother and mother just bought me 2 bromeliads for my classroom and I’m wondering if the lights in the room will be enough. I have no outside window. Do I need to take them outside once a week or so? Can you help me please I think I’ve over watered my Bromeliad the flowers have gone all brown and dry, can I save it anyway? I just purchased eight bromelliad plants (quite expensive at over $80) last week and today I noticed a small spider web in one of them. When I tried to remove the web, dozens of tiny, miniscule, red spiders began runing all over the plant. 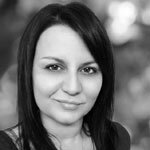 I read your article from beginning to end, as well as all the questions to see if I could find what kind of pesticide to use, but found nothing. Can you please advise me?